The Cowichan Garry Oak Preserve on southern Vancouver Island holds the secret to one of the Nature Conservancy of Canada’s best restoration success stories. Once overrun by invasive plants and agricultural grasses, the preserve now boasts a vibrant community of native species, including many species at risk that rely on the globally rare Garry oak habitat found here. Less than 10 per cent of this ecosystem is left in the world, and yet these woodlands and meadows support the highest biodiversity of plants in coastal British Columbia. From Hwy 1 in Duncan, head east on Trunk Road, which turns into Tzouhalem Road. At the roundabout, exit onto Maple Bay Road. CGOP is at 1241 Maple Bay Road. Access by special permission only. 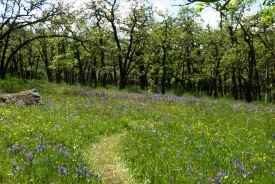 Preserve is opened to the public one day each spring for the In Bloom Wildflower Festival. Visitors can enjoy a short interpretive boardwalk off of Maple Bay Road that juts into the preserve and offers a view of this rare and special habitat. Except for the boardwalk and viewing platform, do not enter the preserve without permission. When in the preserve, stay on trails. Do not trample the wildflowers. Do not disturb wildlife, bird houses or research plots.